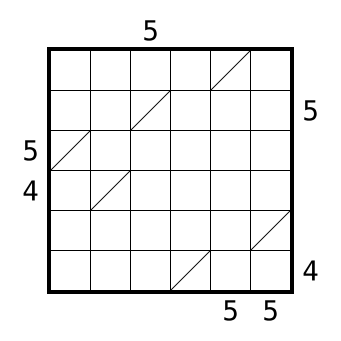 Here’s another fractional skyscrapers puzzle. Numbers 1-7. Edit: flipped, prettier this way. This entry was posted in Puzzles and tagged fractional skyscrapers, hard, skyscrapers, variant on 2014-09-11 by rob. Guess I had skyscrapers on my mind after batch-solving the first week of Roland Voigt’s daily puzzles. No, it doesn’t solve as a tightfit skyscraper puzzle. Rules Place a number between 1 and 6 in each cell (one in each triangle for divided cells) such that each row and each column contains every number from 1 to 6 once. Reading the divided squares as fractions, the numbers in the squares represent the heights of skyscrapers. 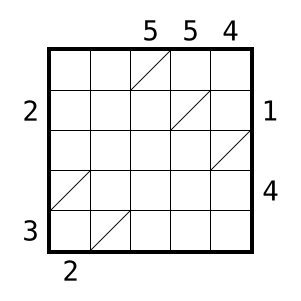 Clues outside the grid indicate the number of skyscrapers that can be seen when looking into the corresponding row or column. Skyscrapers block the view to any other skyscrapers of smaller or equal height behind them. This entry was posted in Puzzles and tagged fractional skyscrapers, medium, skyscrapers, variant on 2014-09-08 by rob.